Are Ravens As Socially Savvy as Humans? It’s been widely known for a while now that the northern white rhino is near full extinction. This breed of rhinoceros has been reduced to a small range of only 6 now that one of them has recently passed. Beforehand, northern white rhinos existed in parts of the Democratic Republic of the Congo (DRC), Chad, Central African Republic, Sudan, and Uganda. This new reduced number exists because one of the last surviving northern white rhinos, Suni, a 34-year-old male living at Ol Pejeta Conservancy in Kenya has passed. He was thought to be the last living male young enough to breed. Suni was actually the first northern white rhino born in captivity back in 1980 at the Dvůr Králové Zoo in the Czech Republic. Back in 2009, Suni and three other rhinos of its ilk were moved to the Ol Pejeta Conservancy. This decision to move them from their natural habitat was made in order to help them breed much easier. This plan didn’t come to fruition though, plus additional efforts to aid the rhinos breeding failed. 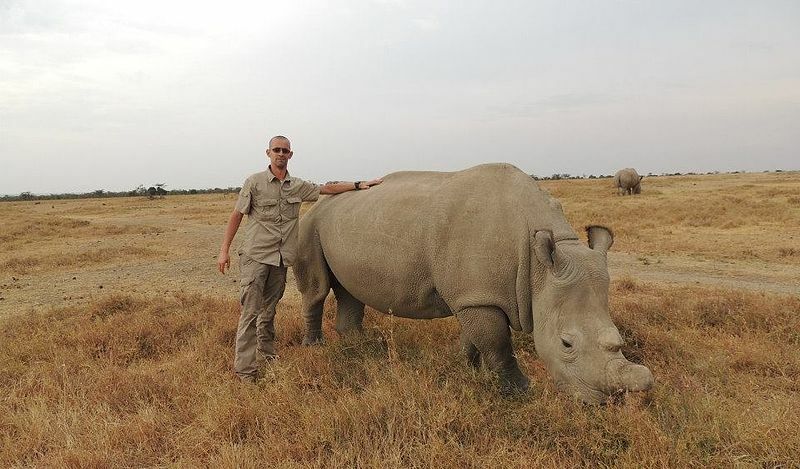 It is with great sadness that we announce the death of one of our northern white rhinos, Suni. Suni was one of the four northern whites residing on Ol Pejeta Conservancy. He was born 34 years ago at the Dvůr Králové Zoo as the first-ever northern white rhino to be born in captivity. Together with one other male and two females, he was translocated from the zoo to Ol Pejeta in 2009. Our rangers found him on the morning of October 17th, 2014, dead in his boma. Suni was not a victim of poaching and we have yet to establish the cause of his sudden death. The Kenya Wildlife Service vets will conduct a post mortem as soon as possible. In 2006, his father Saút died in the Dvur Kralove Zoo by natural causes at the same age as Suni was now. This subspecies of rhinoceros once came in a healthy number of over 2,000 back in 1960. Due to poaching and the continued destruction of their natural habitat, that number was decreased to only a few by the end of the 1980s. By 2008, northern white rhinos were considered near extinction. In an even sadder bit of news, the last remaining group of northern white rhinos (just four) at Garamba National Park in DRC were poached before being moved to a safer park in Kenya. Animal experts note that it might be 10 years before the last northern white rhino passes away. The conservationists at Ol Pejeta are doing their best to prevent this from happening. They have frozen the sperm of Suni and other male northern white rhinos, which can hopefully be used to breeding northern white rhino females with southern male ones. This plan could help regenerate the world small population of northern white rhinos.